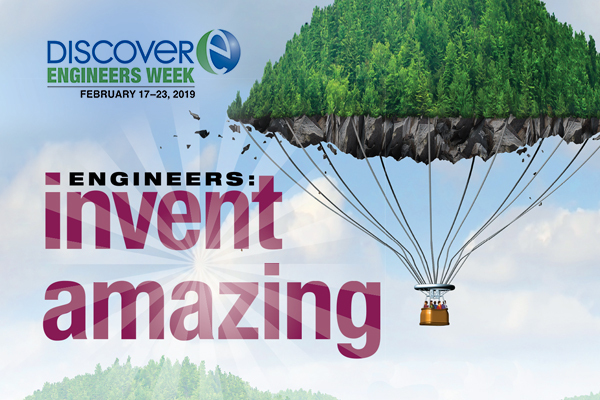 The 2019 DiscoverE Co-Chairs leading the National Engineers Week 2019 include the DiscoverE Leadership Council* and the National Council of Examiners for Engineering and Surveying® (NCEES). To learn more about other national DiscoverE programs click here. *Bechtel, Bentley Systems, ExxonMobil Corporation, NCEES (National Council of Examiners for Engineering and Surveying), Northrup Grumman Foundation, Shell Oil Company, TE Connectivity, Underwriters Laboratories. * Events with an asterisk require pre-registration. We are pleased to offer many entertaining and enjoyable events in 2019. Contributors to the local celebration of National Engineers Week include the UD College of Engineering, the COE Student Organizations, UD Engineering K-12, the Delaware Council of Engineering Societies (DCES), and JPMorgan Chase Co.
We hope you will make time in your busy schedule to attend and participate in a few of the events as we celebrate the 68th anniversary of National Engineers Week! Many events are free and open to the UD community. For further information and updates call (302) 831-2401 or email us at engr-contacts@udel.edu.